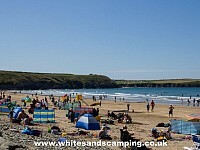 A spectacular beach side setting and ideal camping location. Considered among the top 10 beaches in the world (National Geographic). EEC award winning Blue Flag for water quality. BBC Countryfile's "Beach of the Year 2014/15". Broadband Wi-Fi is available on site. Right next to Whitesands Beach behind the dune. Sunday Times Travel (July 2018) "best place to stay" in Whitesands. 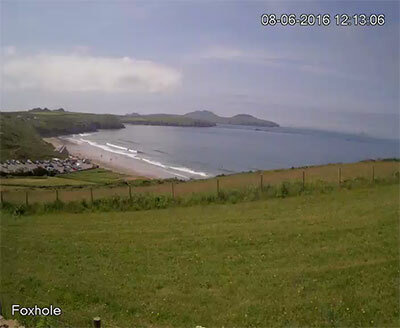 Only a short walk (500 metres) to St Davids dunes Golf Course (9 hole). 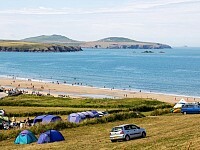 Close to St Davids (2 miles), with buses every half hour in the summer. One of the best surfing beaches in the country. Manned by RNLI Lifeguards from May through to September. Wet suits and boards available for hire (book through Ma Sime's Surfing). 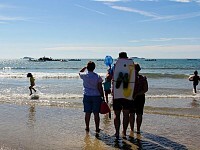 Surf lessons available in summer months. Right next to the beach behind Whitesands dunes. Surely it doesn’t get much better than this! Pitch up alongside Whitesands Beach: choose the best waves from the comfort of your tent; go for a swim when the tide is just right; explore the rock pools below you; and experience the magic of a Whitesands sunset. Click to see live view. The facilities provided are basic: showers (two with tokens), an outdoor shower, toilets, 14 electric hook-ups, and water taps dotted about the place. There’s plenty of room in the fields for a game of football or cricket; at the Beach Car Park you can book surf lessons and hire equipment, including windbreaks and recliners. The “Coaster” bus travels to St David’s every half hour during the summer months (May to September); and the beach is manned by RNLI Lifeguards over the same period. A shop, situated in the beach Car Park, is open for most of the year. 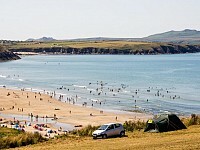 Pembrokeshire Coast National Park imposes a dog ban on Whitesands Beach between 1st May and 30th September.